Keep seats looking new for years with slip-on SeatSaver seat protectors. Custom fitted, they provide protection from sun, dirt, outdoor fun, and abuse during the workweek, to help keep seats looking new. Travel in comfort - breathable, heavy duty polycotton fabric won’t give that "sticky" feeling that neoprene or vinyl seat covers will. 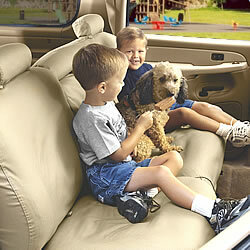 If the SeatSavers become soiled, just throw them into a home washer and dryer and then slip them back on. Currently, please expect 3-5 weeks for your order to ship. SeatSavers are made with a jean-type Polycotton drill weave fabric that’s super strong, long wearing and BREATHABLE. 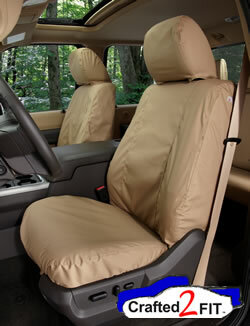 SeatSavers have a durable water resistant finish that will allow you to wipe up spills before they can soak into the fabric, but the fabric "breathes" (just like jeans) so you stay comfortable and don’t end up sticking to the seats.